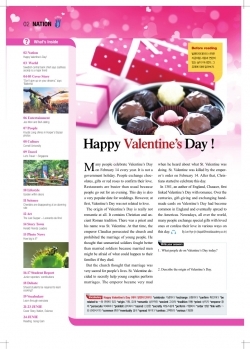 Many people celebrate Valentine’s Day on February 14 every year. It is not a government holiday. People exchange chocolates, gifts or red roses to confirm their love. Restaurants are busier than usual because people go out for an evening. This day is also a very popular date for weddings. However, at first, Valentine’s Day was not related to love. The origin of Valentine’s Day is really not romantic at all. It contains Christian and ancient Roman tradition. There was a priest and his name was St. Valentine. At that time, the emperor Claudias persecuted the church and prohibited the marriage of young people. He thought that unmarried soldiers fought better than married soldiers because married men might be afraid of what could happen to their families if they died. But the church thought that marriage was very sacred for people’s lives. St. Valentine decided to secretly help young couples perform marriages. The emperor became very mad when he heard about what St. Valentine was doing. St. Valentine was killed by the emperor’s order on February 14. After that, Christians started to celebrate this day. In 1381, an author of England, Chaucer, first linked Valentine’s Day with romance. Over the centuries, gift-giving and exchanging handmade cards on Valentine’s Day had become common in England and eventually spread to the Americas. Nowadays, all over the world, many people exchange special gifts with loved ones or confess their love in various ways on this day.